Spider IV 15, Modelling Combo Guitar Amp from Line 6 in the Spider IV series. The POD inventor comes back - for the fourth time - with its Spider modeling amp range. This time around we deal with the small, 15-watt combo which offers six effects, four amp models and some nice additional functions for less than $100. So what about the sound quality? The concept of the Line6 Spider range is very simple: to offer the brand's famous amp modelings in an affordable, compact, solid-state amp family and in all imaginable sizes and power ratings, from the extremely compact, battery operated, 6-watt Micro Spider (already tested at AudioFanzine) to the 150-watt amp head and the 15, 30, 75 and 120 watt models. There's an amp for every budget and ear! However, the amp family is divided into two: on the one hand the Micro, 15 and 30 models that provide four amp models and six effects, and on the other hand the 75-watt and bigger models offering numerous signature presets by famous guitar players and bands. Like the POD family, every new Spider generation provides better sounding amp models, so the Spider IV tries to overshadow the successful Spider III Series of 2008. How good is this new Line6 generation? That's exactly what we'll try to unveil by testing the Spider IV 15 whose very aggressive price surely makes all competitors tremble. The Spider IV 15 looks just like any other Line6 amp, it seems like there are no aesthetic changes. Black outfit, chrome knobs and good manufacturing quality: this amp will withstand boot kicks and beer tossings. The only evident change are the preset knobs. They are not as loose as on the previous generation which is a very good point. In all other aspects, the manufacturer remained faithful to its usual standards and even if the Spiders have no killer looks, at least they don't look too flashy and can pass unnoticed. This is a compact amp, perfect for bedroom use thanks to its dimensions and output power. It weights only 17 lb. and it's not exactly big (16.1" x 15" x 8.7"). It sports a top handle for easy transportation and reinforced corners to protect it from all the violence out there. The speaker covering and connectors seem to be sturdy. Just the way it should be! The cabinet hosts a 15-watt solid-state power amp and a Line6 "custom designed" 8" speaker. Connections include a guitar input, a CD/MP3 stereo input on 1/8" mini-jack and a phones/record output on a 1/4" jack for your headphones, mixer or sound card. You'll also find a RJ45 jack to connect a Line6 footboard (FBV2 or FBV Express mkII). Don't bother buying a more expensive footboard for the Spider IV 15 since you won't be able to use most of its functions. The FBV Express mkII will allow you to toggle between the four amp models, control the volume or the wah effect using the expression pedal, tap the tempo, or turn the internal tuner on. This footboard actually has a very convenient display that makes guitar tuning a breeze. The Spider IV 15 is very easy to use. The first thing to do is select the amp model: Clean (clean sound), Crunch ('68 Marshall Plexi 100 emulation), Metal (based on the Mesa Boogie Dual Rectifier), or Insane (emulation of the Dual Rectifier red channel). Then you have the 3-band EQ, gain knob and channel volume control. You can have four different sounds, whereas each amp model corresponds to a channel. To save your EQ, gain and volume settings simply press the "Amp Models" button a couple of seconds. This solution is very simple but somewhat limited: it will be impossible to save several presets using the same amp model since each amp model has only one preset. Thus you'll have one clean, one crunch, one metal, and one insane preset. It's a pity because some guitar players might need two clean and two crunch presets, for example. The effect section consists of two knobs: the first one is dedicated to the chorus/flanger, phaser and tremolo effects while the other one controls the sweep echo, tape echo and reverb. Each effect is assigned to one third of the knob and its settings range from subtle to extreme. You can edit only one parameter per effect, so don't expect too much when it comes to sound design. However, it's nice to have these possibilities considering the price of the amp. As a summary, there are six effects and you can use two of them at the same time. Time-based effects can be edited using the Tap Tempo button, which also serves to activate the tuner. 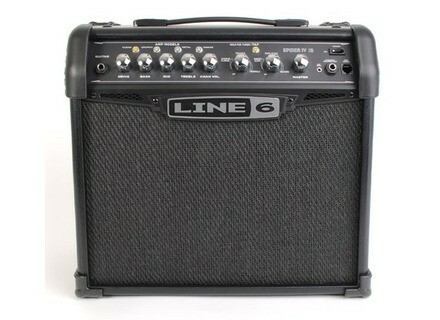 Finally, Line6 added a master volume control at the end of the signal path. 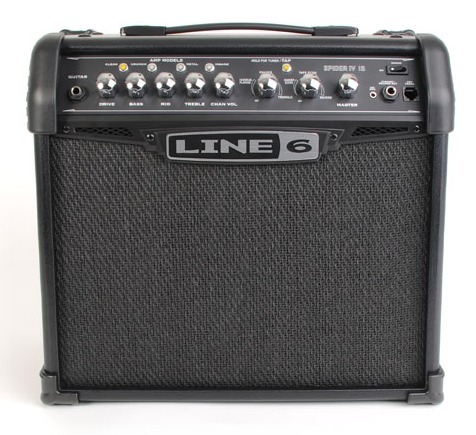 The main advantage of this small Line6 amp is its versatility. You can toggle between clean jazz and blowing distortion with a single button. The Spider is very easy to use and we liked its smooth and well-balanced clean sound. Considering the small 8" speaker, we feared it would lack low frequencies but it proved us wrong. The EQ does a fine work and the gain allows you to get a slightly crunched sound. The Crunch amp model also does a good job and provides a great distortion sound with humbucker pickups. On the other hand, the Metal and Insane amp models disappointed us a bit: they tend to sound like a "bee swarm" and become aggressive and annoying. It is at this point that the speaker shows its limitations and all disadvantages of solid-state sound are brought forward. If you love fat heavy metal distortion try the amp before buying it or you might end up very disappointed. Setting effects is quite a feat and you'll have to watch out not to be dragged into the abyss of the worst music productions of the 80's. Keep it subtle and with good taste and everything will be fine. Chorus/flanger and phaser effects are rather easy to use but the tremolo effect cannot be synced with the Tap Tempo button! The sweep echo is nothing to brag about but the reverb and tap echo sound quite alright. Don't forget that this amp was conceived to play in your bedroom and that it costs less than $100. Be happy that it has any integrated effects at all! Below you can find some sound samples recorded with an Ibanez FR2620 guitar and a BeyerDynamic M88 mic. If we look at how the market has evolved over the last couple of years we'll notice that the price of low-range guitar amps has tumbled down while the quality has continuously improved. This new Line6 amp confirms this trend and sets a very high standard in the $100 guitar amp market. With its amp modelings, six effects, integrated tuner, phones/record output, and MP3 input it's a very comprehensive product available at an extremely aggressive price. Some of its features are only average but you can hardly blame it. The Spider IV 15 is perhaps the first ideal amp for beginners.